Great cleaning performance, high efficiency, a cool-looking display panel and a moderate price tag for a front-load machine make the Electrolux EFLS617SIW a top pick among experts and users. It comes in white and titanium. A top performer. Most experts are in rare agreement when it comes to the cleaning prowess of the Electrolux EFLS617SIW. At Reviewed, tester Jonathan Chan gives it a perfect 10 score, also conferring on it both Editors' Choice and Best of Year awards, saying, "after two weeks of testing, 160 lbs. of clothes, and 20 loads of laundry washed in the Reviewed.com laundry labs, we can say that Electrolux's new flagship washing machine truly impressed us in every way." Megan Wollerton at CNET concurs, giving the Electrolux EFLS617SIW a 4-star rating. She and Chan both call out the innovative SmartBoost feature that mixes water and detergent as it's added to the load, which results in clothes that are measurably cleaner in tests. Good Housekeeping is also a fan of the EFLS617SIW, finding no "cons" and making it one of their top recommendations after their most recent round of washing machine tests. At Consumer Reports, although it earns just middling ratings overall, it does rate an Excellent for washing performance. Owners' reviews round out the picture, and they side with the experts who love the Electrolux EFLS617SIW, making it one of the highest-rated washing machines we evaluated for this report. Particularly popular with users is the 15-minute quick cycle (which Chan praises as well). Many also note that, as expert testing found, it wrings out more water in the spin cycle than comparable washers, so your dryer doesn't have to work as hard. 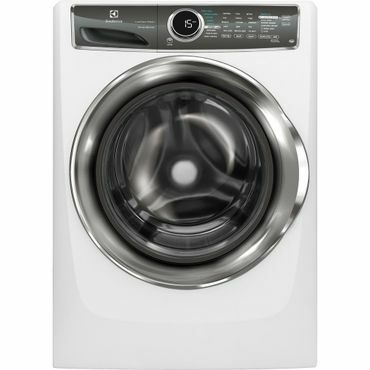 And it pairs with a very well-reviewed dryer, the Electrolux EFME617SIW ($1,000). Top efficiency. The Electrolux EFLS617SIW is Energy Star Certified, and its annual energy cost is estimated at $10 when used with an electric water heater. In testing at Reviewed, Chan estimates it will cost $29 a year to run, including energy and water, which he says, " makes it one of the most efficient front-load washers we've ever tested." Consumer Reports rates it as Very Good in both energy and water efficiency. Pared down to the necessities. Bucking the "more is more" trend in washing machines -- some of which offers dozens of possible wash combinations -- the Electrolux EFLS617SIW has just nine. Chan is a fan of that simplification, as are many user reviewers, when it comes to laundry, most people seem to think less is more. And it's not like it's bare bones, either. There's still five selections each of temperature settings, soil level, spin speed and even a delay start. You can add steam for greater stain removal, and there's a sanitize option for those germy stuffed animals, or whatever else you want to make sure is really clean. "No better washer for the money." That's what Chan says about the Electrolux EFLS617SIW. In her review, Wollerton at CNET notes that the Electrolux out-performed a pricier washer, which she says makes, "this budget-friendly Electrolux washer a superior value that's easy to recommend." Although it retails for around $1,000, it can often be found at $900 or less (especially with careful shopping); $1,000 or less for titanium. Electrolux is a company with a sterling reputation both for quality and for customer service. The EFLS617SIW is covered by a one-year warranty on the washer, a 10 year motor and lifetime tub warranty.